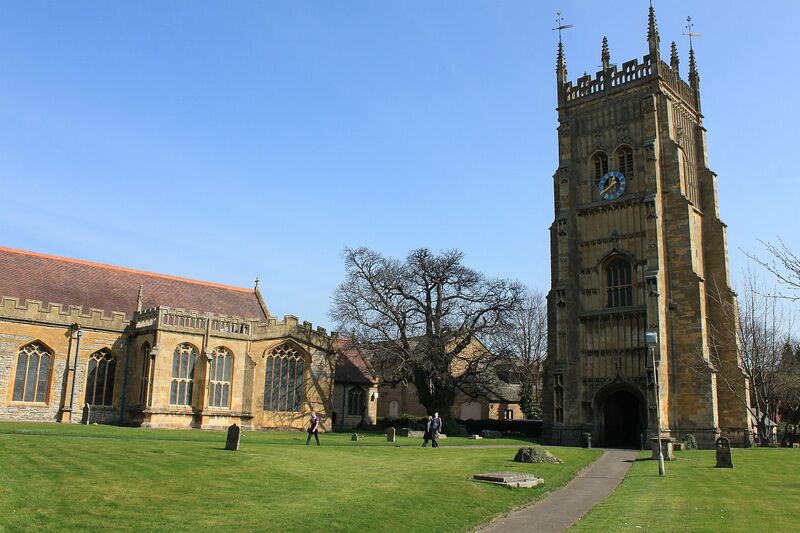 More pics from our work on the Evesham Abbey weathervanes – follow this link to our recent post about this interesting restoration project. 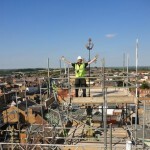 Martin Smith and James Cuthbertson went to Evesham last week to dismantle the first of the four weathervanes. Working high on the scaffolding, they started with hand tools – thankfully the first one came apart easily, apart from the bottom section of the spindle which was very well secured and had possibly been cast into bronze assembly. James and Martin unbolted the cardinal points and the crown from the top of the spindle, which then allowed them to remove the griffon detail. 65 years of weather had corroded and sealed this firmly on, so the two men winched up a gas set and heated the socket at the base to loosen it up. 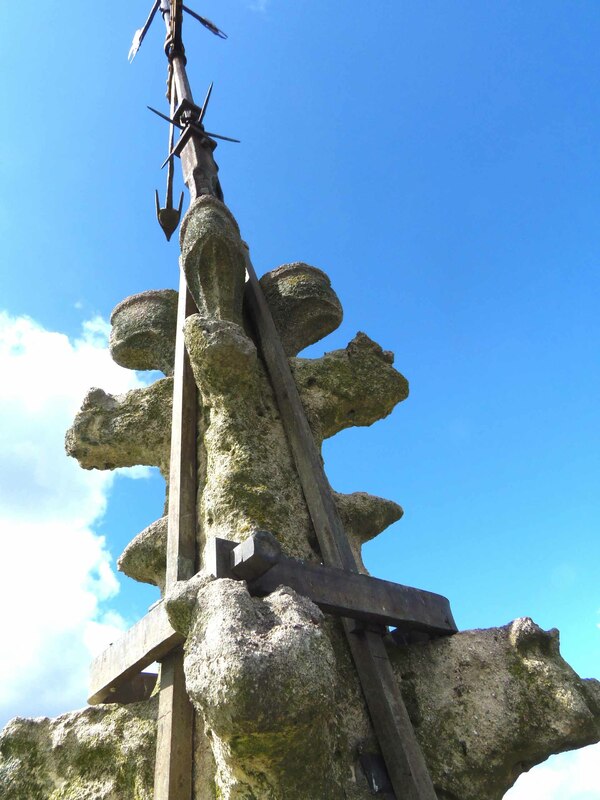 This was a bit nervewracking because the base of spindle also forms the clamps around the delicate stone pinnacles (see pictures on our previous blog post).Thankfully they eventually came free without damage to any part of the weathervane or pinnacle. The vanes were then winched down on two ‘gin wheel’ hand pulleys. Having studied the weathervanes in detail, James is of the view that the vanes were made at the same time as the clamp assemblies. Although the iron has weathered and looks old, the bronze has weathered better. Looking at the flames on the forged griffon they appear to have been flame cut from sheet – identifiable by the distinctive edge quality. James comes from Evesham and was contacted by several people who apparently know the provenance and history of the weathervanes, we’ll update you when we know more. The four vanes are now here in our workshop in Larkhall, Bath. They will now be flame cleaned and minor repairs will be carried out by our restoration team before they are re-gilded and returned to Evesham. 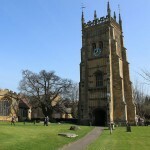 We’ve been commissioned by Sally Strachey Conservation to carry out the restoration of four weathervanes on Evesham Abbey Bell Tower. This beautiful structure is all that remains of a large Abbey complex which was demolished by townsfolk when it was surrendered to the King in 1590 during the Dissolution of the Monasteries. The gilded crown weather vanes are generally in good condition although there is surface corrosion to the frame, and the gilding and paintwork need to be renewed. Our brief is also to redesign the bearing system which has corroded to the point where the weather vanes no longer rotate in the wind. Our solution will need to ensure that minimal maintenance is required in future, as you can see from the pictures the weathervanes are extremely tricky to access! The last restoration was carried out in the 1950’s, and the restorers mark was helpfully stamped into the bronze. 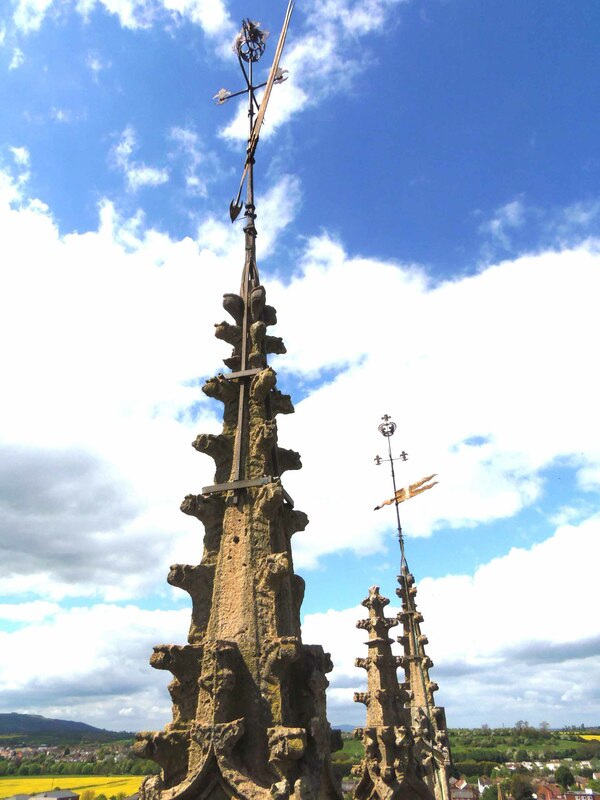 Ironart’s Martin Smith and James Cuthbertson will be travelling up to Evesham later this week to dismantle the weathervanes and bring them back to the Ironart workshops in Larkhall. We’ll post more pics and update you as this project evolves.